The epic battle for Middle-earth! Framed limited edition film cell from The Lord of the Rings: The Return of the King. Features 2 clips of real film, 3 breathtaking images, a numbered plaque, and a certificate of authenticity! Measures 20-inches tall x 11-inches wide. 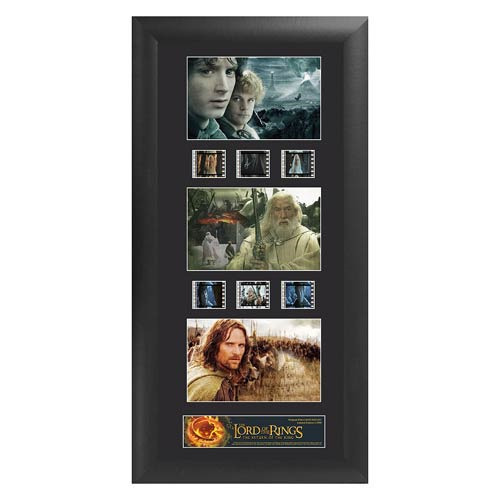 This Lord of the Rings Return of the King Series 1 Trio Film Cell is a limited edition of 2,500 pieces that contains 2 clips of real film, 3 breathtaking images from the movie The Lord of the Rings: The Return of the King, and a numbered limited edition name plaque. These elements are double matted and placed within a beautiful black wood frame that measures 20-inches tall x 11-inches wide and comes with a Trend Setters embossed/foiled certificate of authenticity. Made in the USA. With Mount Doom clearly in his sight, Frodo can feel the end is near as long as he does not give in to the power of the One Ring. In order to accomplish his mission, Gandalf and Aragorn must do their part in the fight against the powers of Mordor. The epic battle for Middle-earth is depicted in this wonderful collectible presentation.